Live Schematics | CD Industrial Group Inc. In a hurry? Jump ahead to Mobile Equipment, Stationary Systems, or Process Equipment. Why the Emphasis on Schematics? We talk a lot about documentation and schematics. Why do we make such a big deal about it? Schematics are not just for initial assembly! Schematics are incredibly useful tools for troubleshooting, for training, and for describing hydraulic and process systems. Think of a schematic as a road map. Imagine if all paths, intersections, and centres along the way were not obviously marked. And just like a road map, accuracy becomes more important as your system becomes more complex. Okay, so what's a Live Schematic? A traditional paper schematic shows you your system at rest. You have to interpret the meaning of the abstract symbols before understanding anything about how the system works. Then you have to mentally combine that component-level understanding into a sense of how the overall system behaves. This is really hard to do correctly, even for experts, especially when working under pressure (like trying to quickly troubleshoot a problem). 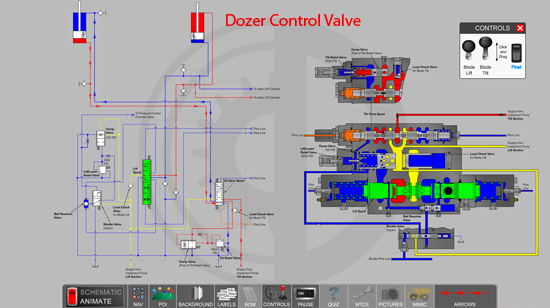 A Live Schematic is an animated & interactive version of your schematic, researched and produced by CD Industrial Group Inc. You can see it respond to controls, just like the real system: move a valve to open up an entire flow path, or deadhead a cylinder and make a relief valve pop open. It is so much more efficient and effective to have your schematic show you flow paths and pressure values during the different stages and operating states of your system. 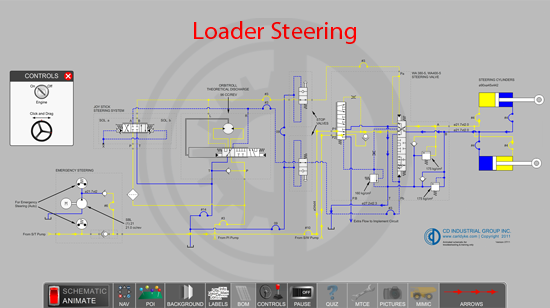 Use realistic operator controls and add variable load resistance and obstructions. All motor functions are active. 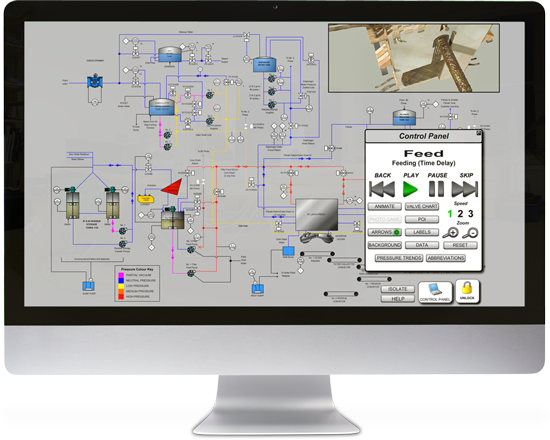 Imagine the possibilities for learning, training, and troubleshooting on an animated, interactive simulation of your system, specially customized to match the real behaviour of your equipment. Sub-circuits match with your master schematic precisely. Machine mimic animations move as schematic symbols move for deep learning. Complex pressure controls and flow dividers are demystified. Line pressures are shown with an arrangement of colours to represent the range of system pressures, including vacuum and atmospheric pressure. Flow paths are shown with moving arrows that trace along pressure lines. Electrical circuits show the flow of current. 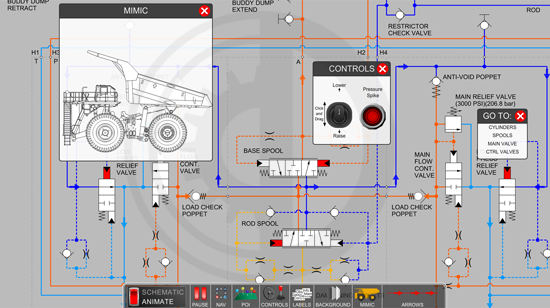 Every element is animated and interactive, simulating the actual usage and real behaviour of your equipment. Steering is essentially a mechanically controlled servo function. Watch the linkage, valve and cylinders react as students manipulate the on-screen controls. Basic Live Schematics include a full system behaviour simulation. Additional features can be introduced for extra training and troubleshooting power, including faults, troubleshooting charts, component information, picture-to-symbol matching, solenoid charts, games and quizzes to test learning, special modes, and matching 2D or 3D views of machines in motion. See graphic cutaways side by side with your schematics, to help bridge the gap between schematic symbols and their real world equivalents. What are the advantages of a Live Schematic? It makes schematic reading easy and intuitive. It can be customized precisely for your machine, and your own training goals. Live Schematics give you an accurate baseline for comparison to the correct behavior of your machinery on those occasions when it fails or crashes. The simulation allows operators and mechanics to test machine performance in a safe environment, and to experiment without risk to life or equipment. Deliverable online, on CD, in your LMS, and as part of every one of our training courses. 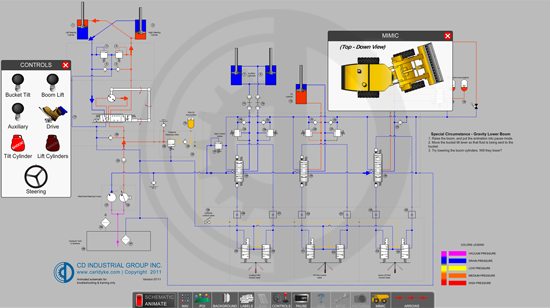 CD Industrial Group Inc. has a lot of experience in creating Live Schematics for mobile equipment. Clients have asked us for loaders, graders, shovels, dozers, haul trucks and more! Depending on client needs, we have often found it useful to incorporate the sudden surprises that the physical environment can throw at a mobile machine. In the example shown, we provide a button to "shock" the bucket tilt cylinder on a loader, as occasionally happens in real-world operation. We can remove the mystery with Live Schematics! CD Industrial Group has built Live schematics for pulp and paper, bulk materials handling, hydro stations and more! Add clarity to your troubleshooting with a Live Schematic. Stationary equipment often benefits from machine mimics, solenoid charts, and, of course, realistic controls. Live Schematics are not just for hydraulic systems! We have worked on process equipment, including an industrial filter press, an oil and gas separator, and an oilfield cement unit. Process lines can be animated as well! We can provide isolation modes, skip and rewind steps, pressure trends, and more! Contact us, and we will bring your schematics to life.